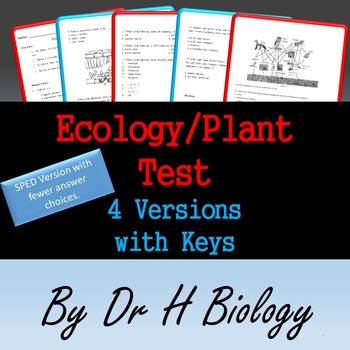 Biology Unit Test: Ecology and Plants - 4 Versions! 4 Versions! This 25 question test contains True/False, multiple choice, and diagram analysis questions about plant structure and function, symbiotic relationships, and natural selection. Version B is a modified version for students that need fewer answer choices. Versions A, C and D are the same test but rearranged. 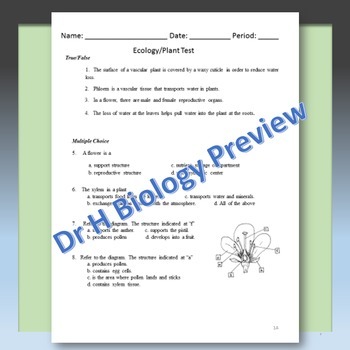 This test is also in my Biology Test Bundle. The product below contains four resources in one. It will continue to grow and you will be able to receive new downloads at no cost after you purchase it!